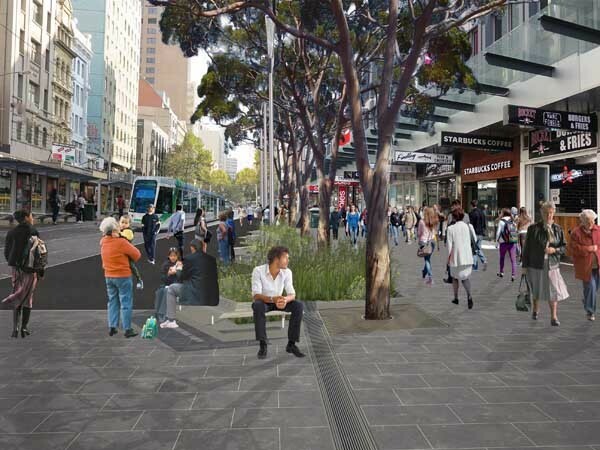 Major upgrade work will soon begin on Elizabeth Street in Melbourne to increase pedestrian safety and amenity in the area. The City of Melbourne will carry out the $2.2 million upgrade to the southern end of Elizabeth Street. Lord Mayor Robert Doyle explains that a key objective of the upgrade project is to improve the functionality and safety of the street, making it a more attractive gateway for the thousands of pedestrians who use it every day. The upgrade will also include new street furniture, better lighting, bluestone paving, drainage improvements and trees. According to the Lord Mayor, the corner of Elizabeth Street and Flinders Street sees about 9300 people per hour during the morning peak, making it one of the busiest pedestrian intersections in the CBD. For the convenience of pedestrians, the City of Melbourne proposes to exclude southbound traffic between Flinders Lane and Flinders Street by October this year. This will not only help more than double the amount of space available to pedestrians but also improve access to key public transport interchanges at Flinders Street Station and Elizabeth Street tram terminus. Five key components were identified for the final concept plan for Elizabeth Street South following stakeholder and community engagement in 2016. These include removing the Southbound traffic lane; introducing a new pedestrian area; retaining the tram stop; upgrading the Western footpath; and retaining Northbound traffic lane. Work on the eastern side will begin after the upgrade on the southern end of Elizabeth Street is completed.